If you use your debit card at ATMs and at gas stations (and who doesn’t) you can’t with 100% confidence completely eliminate the risk of having your card data compromised by a skimmer. But here are a few simple steps that can significantly reduce your exposure to the risk. Most current skimmers rely on a hidden camera to capture your PIN as you enter it into the key pad. One effective way to foil this device is to shield the PIN pad with one hand as you type in your PIN (see photo). 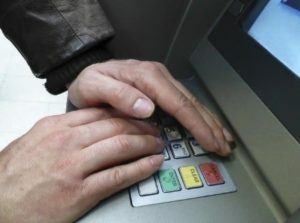 This won’t protect you against more sophisticated skimmers that use keypad overlays, but currently you are much more likely to encounter a skimmer that uses a camera to capture your PIN. This simple step by itself will foil most skimmers that you are likely to encounter. Set up “Debit Card Alerts” in Pathways online banking for transactions over $100. This will generate an instant email/text alert anytime your debit card is used in any transaction over $100. If you get the alert and you (or any of the authorized users on your card) have not used the card, you may have a fraud issue. If this happens, you can call our card processor at 1-800-449-7728 anytime 24/7 and report it immediately. You can also set up Card Alerts by clicking here. While the technology skimmers use is pretty simple, criminals are getting much more sophisticated in their ability to make the skimmers less detectable. However, it still pays to look over any card terminal you are using to see if there are any obvious signs that it has been tampered with or altered. If you find something that seems out of place (a card reader that is loose, a hidden camera, or a keypad overlay), take the cautious approach and do not use that terminal. Be sure to alert the business in charge of the terminal that there may be an issue as well. Recently, there has been an increase in potential identity fraud from the theft of bill payments that are sent via blue US Postal Mailboxes. The checks are then altered – amounts and payees changed – and deposited, generally by ATM at other financial institutions. Do not use the blue US Postal mailboxes until further notice if you intend to mail checks or mail containing personal information. Keep important information out of your wallet. Keep only the bare minimum essential information in your wallet (driver’s license or government-issued photo identification, debit/credit cards, insurance cards, and cash). Things to avoid putting in your wallet include your Social Security Card, anything with your account number/credit union listed, and PIN numbers associated with the cards in your wallet. Be smart about your passwords. The strongest passwords consist of combinations of letters, numbers, and special characters. Consider registering for free software programs that allow you to store your usernames and passwords in one place using one master username/password to access the list. Never leave passwords out near your computer where someone could easily compromise it. The next time you’re in a branch or talk to us over the phone, ask us about setting a code word on your account that we can use to identify you when you call in to make a transaction. Never give any code words, PINs, or passwords out to anyone. Check your credit report and statements regularly. By federal law you may request one free credit report annually from each of the consumer credit reporting agencies (Experian, Equifax, and TransUnion). Visit www.annualcreditreport.com to learn more information and access your report(s). It’s a good idea request this information each year to check your credit report and make sure no suspicious or unusual activity has occurred. Be sure to regularly check online banking/monthly statements to monitor for suspicious activity. Consider enrolling in electronic statements, as they arrive directly to our secure online banking platform at the start of each month, requiring a username and password combination for access. Paper statements are less safe as they could be removed from a mailbox by someone on the hunt for important account information. Be smart when using ATMs. Always be aware of your surroundings and have your card ready to use when accessing an ATM. If you are using a drive-up ATM, make sure that your doors are locked and all passenger windows are closed. Do not use the ATM if you see anyone suspicious loitering around the machine. Be on the lookout for unusual looking card readers, as new technology gives thieves the capability to capture your card data when you insert your card. Always make sure that no one can watch you enter your PIN on the machine. When you finish your transaction be sure to secure your card, receipt, and any cash in a wallet, purse, or pocket before leaving the ATM. Identity thieves aren’t above digging through the garbage/recycling for personal information. Always shred anything that has personal information, including receipts, credit applications, statements, expired cards, and personal insurance documents.